Granite Countertop Warehouse and Crowe Custom Counters and happy to be featuring IceStone in our showroom. 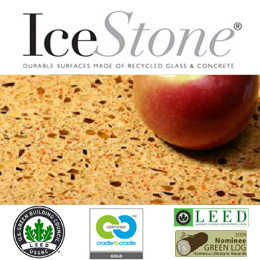 We appreciate the efforts that IceStone has gone through to receive the distinction throughout the industry as being a leader in environmental stewardship and social responsibility. When the EPA honres you…thats a big deal! The U.S. Environmental Protection Agency honored 17 individuals and organizations from across New York with Environmental Quality Awards for their achievements in protecting public health and the environment and IceStone was one of them. EPA Regional Administrator Judith A. Enck presented the awards at a ceremony at EPA’s offices in Manhattan. Michelle DePass, former Assistant Administrator of the EPA Office of International and Tribal Affairs and currently Dean of the Milano School of International Affairs, Management and Urban Policy at the New School for Public Engagement in New York City, delivered the keynote address. The EPA presents Environmental Quality Awards annually during Earth Week to individuals, businesses, government agencies, environmental and community-based organizations and members of the media in EPA Region 2, which covers New Jersey, New York, Puerto Rico, the U.S. Virgin Islands and eight federally-recognized Indian Nations. The awards recognize significant contributions to improving the environment and public health in the previous calendar year. For information about the Environmental Quality Awards in EPA Region 2, visithttp://www.epa.gov/region02/eqa/. IceStone began with a simple concept; transform waste glass into something beautiful. The company has manufactured sustainable recycled countertop materials in Brooklyn since 2003. Each countertop slab contains 70% recycled content and production of these slabs has diverted over 13 million pounds of glass from landfills. IceStone’s recycled glass and cement compositions deliver unparalleled style that brings design to life. More importantly, this local business is a “triple bottom line” business, concerned about economic and environmental accountability and social responsibility.